FACT: This plant contains substances that makes one highly diuretic when ingested. Solidago virgaurea (European goldenrod or woundwort) is an herbaceous perennial plant of the family Asteraceae. It is widespread across most of Europe as well as North Africa and northern, central, and southwestern Asia (China, Russia, India, Turkey, Kazakhstan, etc.). It is grown as a garden flower with many different cultivars. It flowers profusely in late summer. 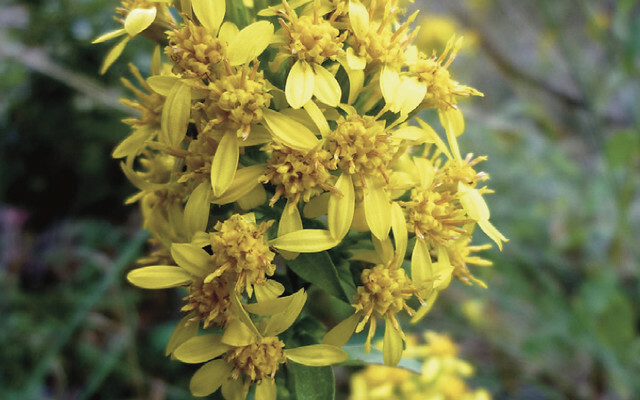 Solidago virgaurea is a perennial herb up to 100 cm (40 inches) tall, with a branching underground caudex and a woody rhizome. It produces arrays of numerous small yellow flower heads at the top of the stem.